THE EDITOR: Brilliant writer and editor and publisher Mark Allen Cunningham. 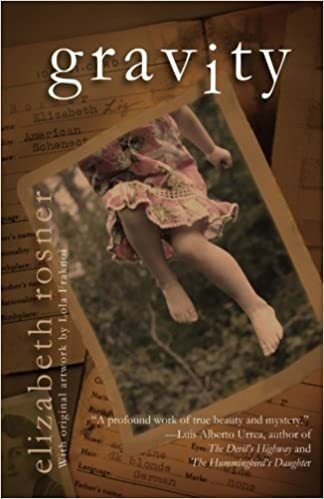 SUMMARY: “Composed over a period of some twenty years, Gravity is Elizabeth Rosner’s profoundly searching account of her experience as the daughter of Holocaust survivors. In an extraordinarily powerful mix of poetry and prose, Rosner traces the earliest remembered resonances of her parents’ past and her dawning awareness of the war history that colored her family home during her youth in Schenectady, New York. She recounts her false starts in raising the subject with her father (a survivor of Buchenwald concentration camp), his piecemeal revelations, and their eventual travels together to the sites of the nightmare in Germany. And she evokes, courageously and heart-wrenchingly, her search for identity against the gravitational pull of her parents’ experience and the traditional upbringing they’ve given her.” (quoted from Atelier26 website) The book also features exquisite artwork by Lola Fraknoi. THE BACK STORY: The summary above should more accurately say that the book was composed over a period of thirty years. Some of the pieces were begun while I was still in my 20s, and while I was trying to figure out whether they were poems or prose. Eventually I realized that a rather blurry line exists for me when it comes to so-called differentiation among forms. Mainly I was interested in finding words to tell as much of the emotional truth as I was able. The resulting collection, as a whole, offers a variety of approaches toward describing what it was like to grow up inside my family, as well as the uncertain and unfinished work of becoming a writer. WHY THIS TITLE? : A long time ago I found myself wondering if the word “gravity” has any (ancient?) intersection with the word “grief.” You’d think I would have looked this up and gone to great lengths to answer the question, but instead, I have chosen to stick to my own metaphoric convictions. That way I get to explore what feels most compellingly accurate — namely, human grief has a palpable weight that is a strange sort of blessing. The title poem was one of the first poems I ever wrote, and it came out of nowhere — surprisingly complete. WHY WOULD SOMEONE WANT TO READ IT? I like to imagine that my book is a chance for people who usually don’t like poetry to discover that it can actually speak to them in a clear voice, with no need for translation or interpretation. I also like to believe that readers can find beauty and sorrow and childhood and adulthood all co-existing in these pages. AUTHOR PROFILE: I am honestly stunned to be able to say that I’m the author of three novels, a book of poetry, and a (new) book of nonfiction. Many of my days are spent staring out the window or into the middle distance, so the fact that these books have managed to be completed and launched into the so-called real world seems nothing short of miraculous. When I’m not traveling or teaching (often these two activities happen together, since I teach writing all over the world), I take my dog Lulu for frequent walks in the endlessly discoverable neighborhood of North Berkeley where I live. AUTHOR COMMENTS: The themes covered within Gravity recur through much of my fiction (three novels, which you can learn more about on my website). This coming September 2017, my first book of nonfiction is being published by Counterpoint Press. It’s called: Survivor Café: the Legacy of Trauma and the Labyrinth of Memory. Here again I am addressing the subject of intergenerational inheritance, but this time I’m expanding the conversation to include focus on several large-scale atrocities of the 20th century. My experiences as a daughter of two Holocaust survivors have led me to feel a deep sense of connection to descendants of survivors of Hiroshima and Nagasaki, as well as Rwanda, Cambodia, and more. The book also includes current research on epigenetics, PTSD, and memory studies. (special sale for $12 here: http://www.atelier26bookshop.com/shop/4592934560/gravity/10889585). CONTACT THE AUTHOR: There are plenty of ways to reach me online. You are welcome to contact me via my website: http://www.elizabethrosner.com, via Facebook: http://www.facebook.com/elizabethrosnerbooks, via Twitter: @elizabethrosner, or via Linked In.